TOPEKA — Hanukkah, or the Jewish Festival of Lights, commemorates the rededication of the Temple by the Maccabees after their victory over the Seleucid Empire. But as Jews throughout the United States celebrate the festival, which runs from Dec. 2-10 this year, people of all faiths are also concerned about the dramatic rise of anti-Semitism in recent months. According to the Encyclopedia Brittanica, the term was coined in 1879 by Wilhelm Marr to designate the anti- Jewish campaigns in central Europe. And the Anti-Defamation League (ADL), an international organization founded in 1913 to “stop the defamation of the Jewish people and to secure justice and fair treatment to all,” has been tracking incidents since 1979. Anti- Semitism can take the form of harassment, vandalism and assault. According to ADL data, the number of anti-Semitic acts from 2016 to 2017 increased 57 percent, the largest single- year increase on record. And the statistics represent only reported incidents. 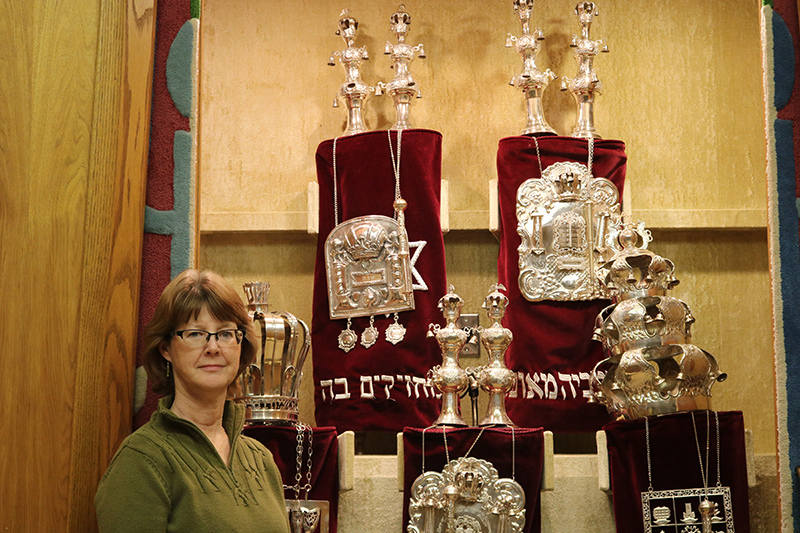 Rabbi Debbie Stiel has led Topeka’s Temple Beth Sholom for 13 years. In that time, she said, she recalls only one act of vandalism on temple property. Still, the Oct. 27 shooting at the Tree of Life synagogue in Pittsburgh that resulted in the deaths of 11 has left temple leaders grappling with being welcoming to guests but also providing a sense of security for 100 families. Dr. Richard Crane, a professor of European history at Benedictine College in Atchison, said American society has seen its share of religious discrimination. Both the professor and the rabbi feel as if the overall climate in American society today is partially to blame. And today’s technology, she said, particularly social media, has contributed to an increase in hate speech. On the whole, though, Crane said America is extremely tolerant, and that’s why Americans become outraged at acts of violence. “We’re virtually all mourning and are horrified together,” he said of the shooting in Pittsburgh. “I think somebody said Jews were murdered, but all Americans were assaulted,” she said, “and I think that’s really how Americans felt. Crane said such acts of hatred are troubling, but he sees hope, too. “I’d like to think that acts of hatred are not indicative of a larger trend in our country, but are examples of extremes,” he said. “[However,] we live in a country where these things are happening. The idea that Jewish people in their schools and synagogues have to have armed guards and extremely heightened security is very, very disheartening. Support, the rabbi noted, is something her congregation has felt. In the aftermath of the Pittsburgh shooting, leaders of the American Jewish Committee encouraged Jews to show up on the next Sabbath in large numbers to show solidarity. “We decided to combine it with an opportunity for the community to come here, too,” said Rabbi Stiel, “both to show their support for the Jewish community and to gain some comfort for themselves. “Typically, we get 35 to 40 people on a Friday night for Sabbath service, and we had over 300 people there that night. The professor and the rabbi noted such events can help build bridges. “Familiarity with Jews as persons actually inhibits anti-Semitism,” Crane said. The same can be said for prejudices of any kind, he continued. Familiarity erodes prejudices as people get to know one another as human beings. Connections, Rabbi Stiel said, can be particularly powerful when made among religious leaders. “I do think that when the religious leaders of the different faiths get to know each other personally, that connection ends up filtering down,” she said. Judy Ulitchny, a member of St. Michael the Archangel Parish in Leawood, and Larry and Patty Pressman, members of Temple Beth Shalom, agreed. As leader of a faith club in which women of the Muslim, Jewish and Catholic faiths come together, Ulitchny said she has learned much and tries to educate others. “There’s so much ignorance of the other faiths,” she said. And ignorance can translate into fear and prejudice. Growing up in Topeka, Larry Pressman played on church-sponsored softball and basketball teams as the only Jewish member. As a result, he developed friendships that made him appreciate the commonalities of other faiths as well as their differences. “We’re never going to eliminate this [hatred] as long as we don’t understand each other,” Patty Pressman said. Both the professor and the rabbi pointed to “Nostra Aetate,” a document which came out of the Second Vatican Council, as being a watershed moment. “I really appreciate the Catholic Church and what it’s done with Vatican II to say you can’t hold all Jews responsible for deicide,” said Rabbi Stiel. “The Jews are still God’s special people as well. Now, she said, the two communities can appreciate each other. Father Joseph Arsenault, SSA, the archdiocesan officer for ecumenical and interreligious affairs, agreed. “When we stand together in solidarity with people from the Jewish community, we stand with our brothers and our sisters,” he said. “We are all children of the one God. It was to the Jewish people that he first revealed himself.